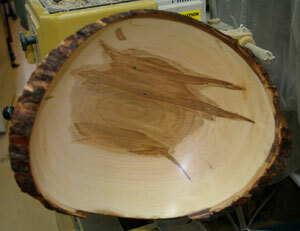 This bowl is a large piece of Ambrosia Maple from the Camden East area. Turning the bowl this way gives the bowl the natural edge and also the oval shape. Wood that is cut during the winter has a better chance of keeping the bark on. I may have to use some super glue to hold the bark in places. The colouring on the bowl is the art work of the Ambrosia beetle travelling around the inside of the tree. While it looks very nice the beetle will eventually kill the tree.